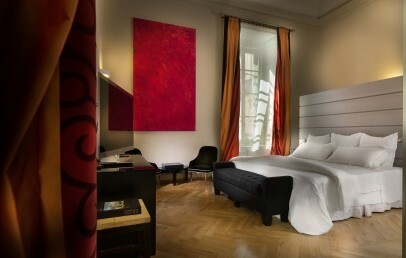 Placed in Milan, the fashion capital of Italy, TownHouse Galleria is a luxury hotel which ensure a great stay for all kinds of holiday in Lombardia. Milan provides a wide choice of cultural sights, shopping streets and its vibrant nightlife is well-known around the peninsula. 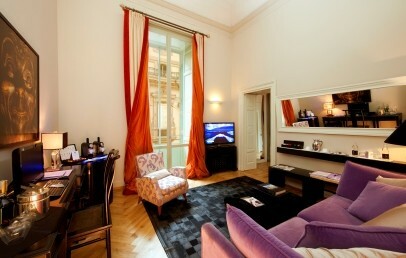 Facing the Galleria Vittorio Emanuele II and its double arcade, TownHouse Galleria enjoys the most strategic location of the city just a walking distance from the Duomo, the Sforzesco Castle, the La Scala Theatre just to cite a few. TownHouse Galleria boasts 5 stars thanks to its fascinating style, professional team and its successful philosophy based on the aspect of individuality. 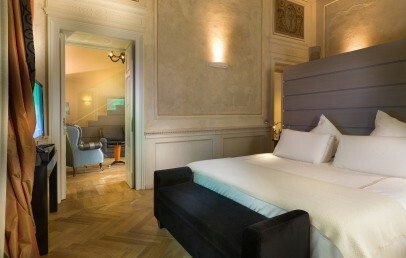 The rooms and suites of the TownHouse Galleria are characterized by the finest modern and antique Italian furnishings. 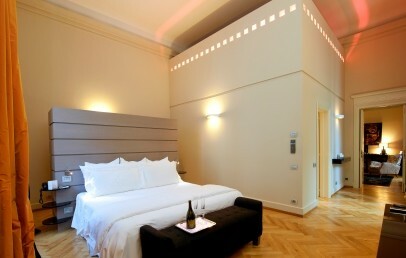 The TownHouse Galleria offers a total of 58 modern and luxurious rooms and suites, which are distributed in a historic building. 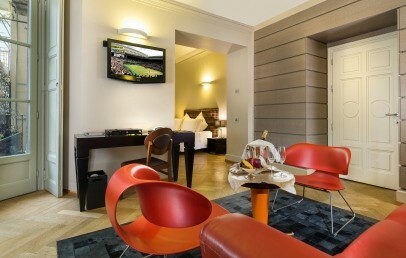 All offer the most modern comfort with the best technological equipment to completely enjoy the stay in the city. 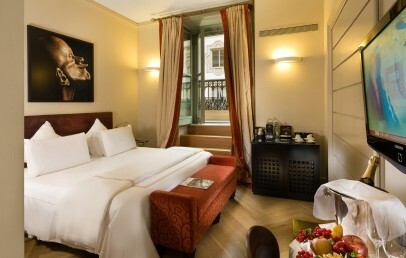 Almost all rooms have views of the famous "Galleria" of Milan, decorated with frescoes and elegant mosaic floor. 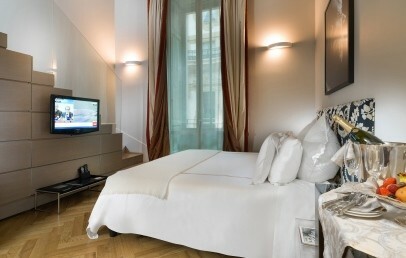 Moreover the suites at the Seven Stars Galleria vary from the square meters and all have direct view of the "Galleria". 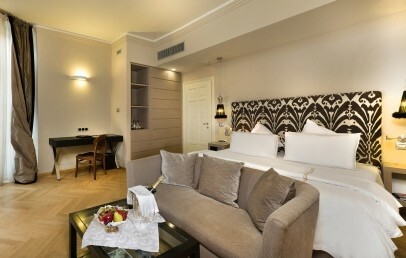 It offers simpler Suites up to the absolutely spectacular Suite: The Presidential. The guests are welcome to the La Sinfonia Restaurant, which is directly connected with a private elevator. The room and concierge services are guaranteed 24/24 hour as well as a multilingual staff, free Wi-Fi access and all kinds of information and reservations. Dogs are accepted at the TownHouse Galleria. The city tax is € 5 per person per overnight and has to be paid on-site. 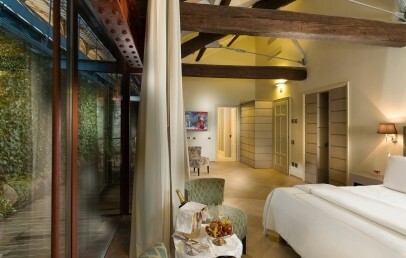 Intimate double room characterized by relaxing colours and both contemporary and traditional style. It provides modern comforts, refined furnishings and a marble bathroom with wooden floors, chromo therapeutic shower and luxury complimentary toiletries. 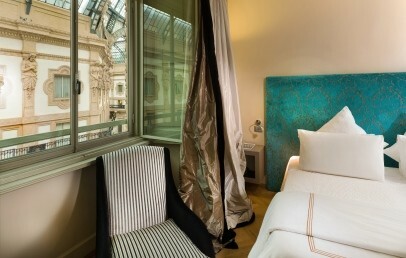 The Courtyard Deluxe overlooks a quiet and internal court of the Hotel. 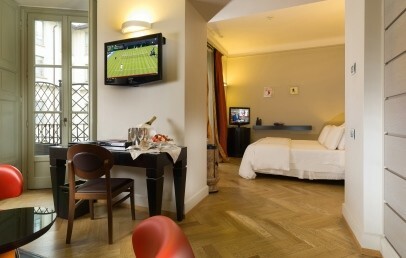 Exclusive and welcoming double room characterized by an intimate atmosphere and wood furniture. 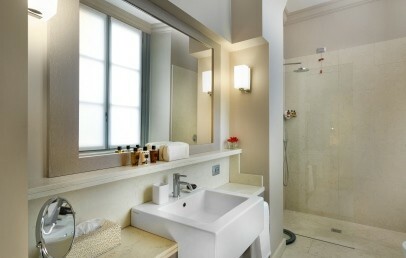 The marble bathroom provides chromo therapeutic shower and luxury complimentary toiletries. The Gallery Deluxe faces nice balconies and overlook the ‘Galleria’. 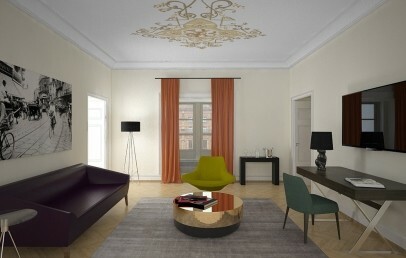 Large and luxury open space suite which presents precious material, warm colours and it is completely soundproofed. 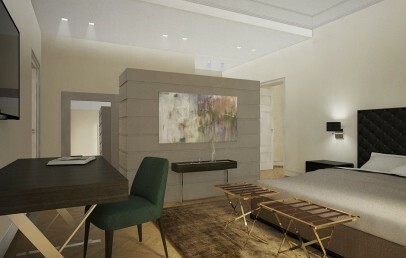 It consists of a lounge area with modern comforts. 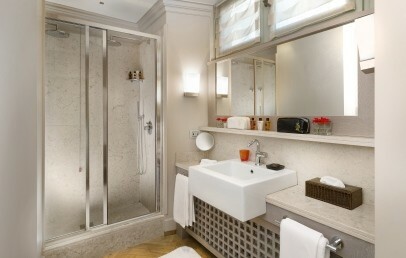 The marble bathroom provides chromo therapeutic shower and luxury complimentary toiletries. The Junior Suites face nice balconies and overlook shopping arcade. 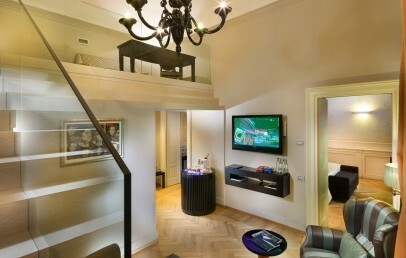 Luxury Junior Suite which presents precious material, warm colours and it is completely soundproofed. 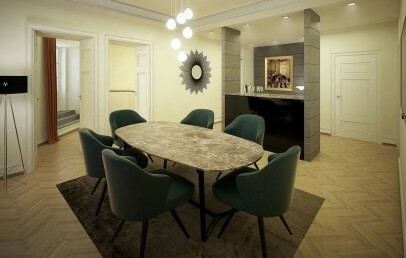 It has a lounge area with modern comforts. 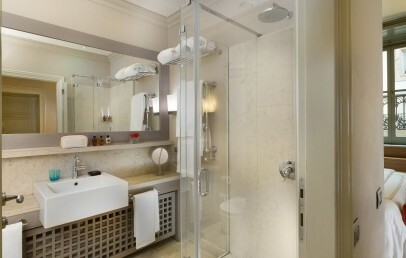 The large bathroom has either a tub or a walk-in shower and a luxury courtesy set. 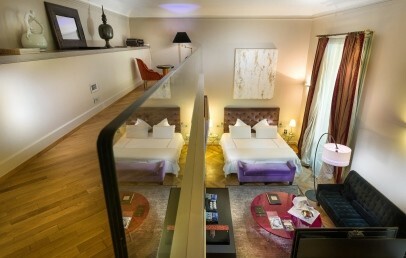 The Junior Suites are located on the 2nd, 3rd or 5th floor and face the courtyard. The maximum occupancy is 3 adults or 2 adults and 1 child. 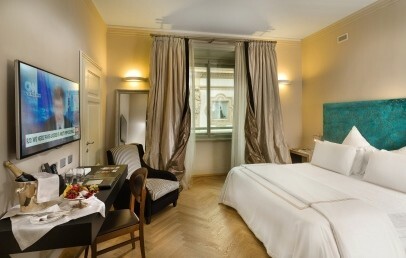 Luxurious and wonderful Junior Suite located on the fifth floor and with exclusive view over the rooftops of the “Galleria” of Vittorio Emanuele II. 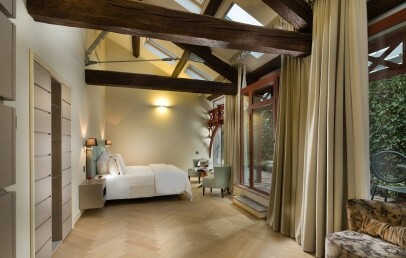 The Suite is fulfilled with daylight, thanks to the big windows and access to the private terrace. 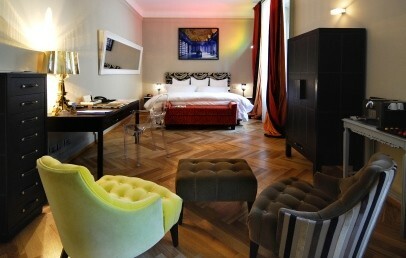 The furnishing is modern with parquet floor, precious textiles and it is completely soundproofed. 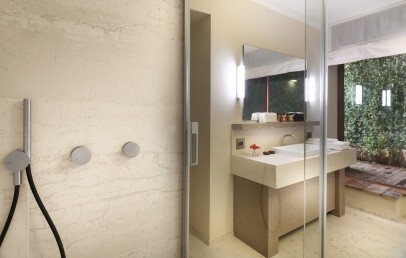 The bathroom has either a tub or a walk-in shower and an elegant vanity area. The maximum occupancy is 3 adults or 2 adults and 1 child. Composed by a double room and a working space mezzanine with computer, fax-machine and colour printer. 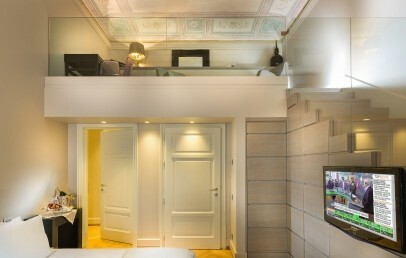 The suite is characterized by beautiful frescoes on the ceilings. The bathroom disposes of a tub and a chromotherapy shower. The Suite is composed by an elegant lounge room and two bedrooms furnished with eclectic design elements combined with classic XVIII-century French styled furnishings. 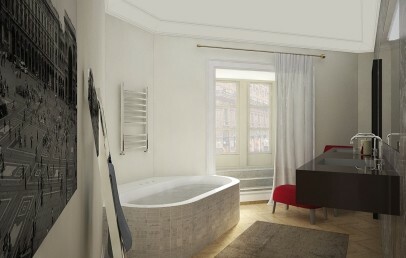 It features en-suite bathrooms with tub and chromotherapic shower.